Well, it's about time. After more than a week of temperatures that felt better suited to the dog days of August than the first few days of fall, on Monday we finally got our first breath of fresh fall air. Stepping out of the office into a pleasant 70F afternoon, the air felt almost brisk. Well, brisk compared with the 90F days we've had recently. This morning, even more so: the skies were overcast, and a breeze with aspirations of being a wind swept in cool air to replace the remaining warm. (You know fall is really starting to hit when the cats are at the window, transfixed by rustling, falling leaves.) By this afternoon, you could taste fall in the air, as if it were whispering, psst! I'm here. And not a moment too soon. For a few weeks now I've been accumulating apples from my CSA share, and this weekend I reached a point where the word "overrun" was not an inaccurate description of my kitchen counter. Between my regular share and my extra fruit option, I get 12-18 apples per week, and even an apple a day won't make all those apples go away. I needed to do something with them, something that would use up a bunch of apples at once and didn't involve making a lot of muffins. I love apple muffins, and in fact I've been meaning to put up a post with my new favorite recipe. But I can only make so many batches of apple muffins--even of the "they're whole wheat, so they're not quite as bad for you!" variety--before I start anxiously eyeing my waistline. The problem, of course, was that it was still hot outside--or at least it was on Sunday, when I decided to take back my kitchen counter. I love my apples spiced, with cinnamon and cloves and allspice, and eating cozy spiced foods when it's hot outside just doesn't feel right. Get me far enough into September, though, with enough apples on my hands, and I get over my squirmy feeling about ill timed spiced apples. Weather be damned, it was (technically) fall and I was going to make my house smell like it. And what better way to do that than with hours of slow cooking over low heat, with aromatic spices and fruit full of flavor? 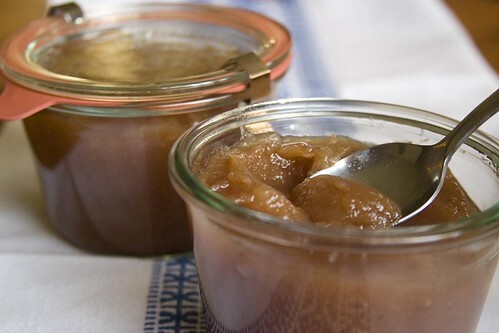 Applesauce is one thing--it's delicious, and it has its place. 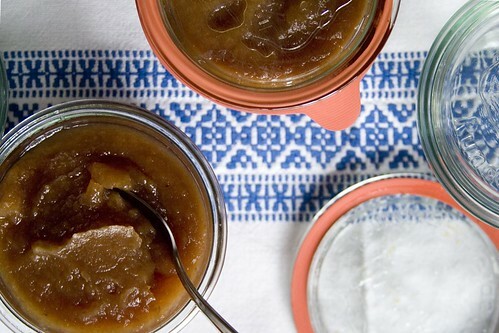 But for the slow cooking and the spices, it's all about apple butter. This was my first time making apple butter, and I can't say that I'm disappointed. Not just with the results, which included making the house smell like everything that is good and delicious about fall, but with the fact that making apple butter turns out to be surprisingly easy. 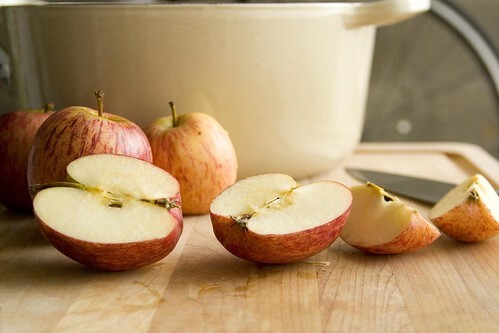 Did you know that you don't even have to peel and core the apples? Extra flavor hides in the peels, and extra pectin in the cores. 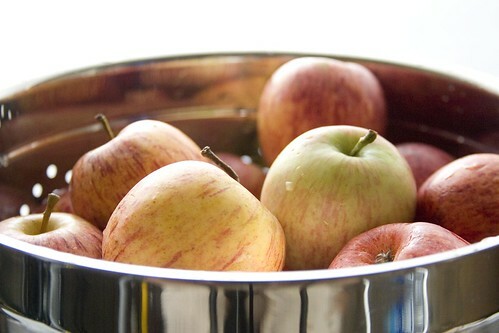 You want both the flavor and the pectin, so you quarter the apples and cook them as they are. Brilliant! You'll need a food mill eventually, of course, as you don't want the peels or cores in the butter. And after the milling, all you need to do is cook and stir, cook and stir. Maybe you adjust the seasonings, and maybe you adjust the heat, but all it needs is a little attention every few minutes. I do mean every few minutes, mind: you don't want it to scorch, and as it thickens it will be more prone to sticking and scorching. You definitely want to keep an eye on it, so this is not one of those recipes where you can get it going and then forget about it for a few hours. (Unless you use a crock pot.) It is a recipe that requires patience, perfect for a rainy day when you're entertaining yourself inside. Fix yourself a cup of tea, clear off a big table, and dig out a puzzle to work on as you tend the apples. I would say make sure you have some bread on hand so that you have toast for when you finish the apple butter; but in truth, there's no reason not to eat it with a spoon, straight out of the jar. Fetch yourself a large, heavy pot. I find enameled cast iron well suited to this task. Rinse the apples well, taking care to remove any debris that you don't want in the butter. 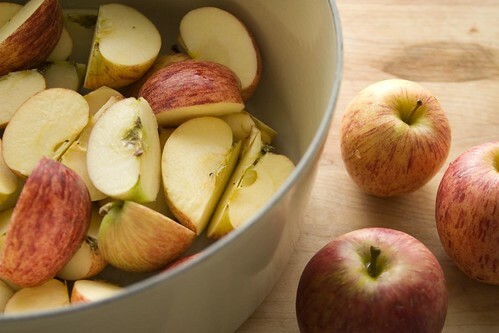 Cut them into quarters or eighths, depending on the size of the apples, and place the pieces in the pot. Add the lemon juice, about two cups of water, and any whole spices (if using), and bring the pot to a boil. Reduce the heat, cover the pot, and simmer until the apples are fall-apart tender. Remove the pot from the heat and let cool slightly. When the apples are cool enough to handle, run them through the food mill (the finer the grate, the better). You might need to pass them through more than once in order to extract all of the applesauce. Measure the resultant applesauce and return it to the (cleaned) pot. Add the sugar, salt, and any ground spices, and stir to blend. Cook the applesauce over low heat, stirring very frequently, until it is very thick and wrinkles a bit when you push it around on a cold plate. 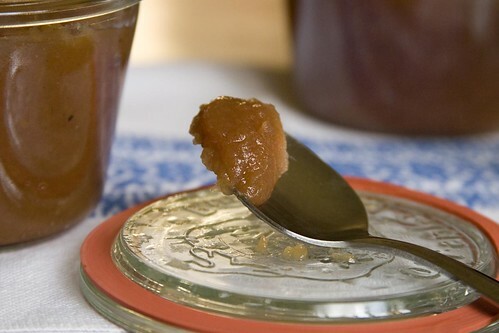 If you are canning the apple butter, pack it while hot into clean, sterilized jars with approximately 1/2 inch of head space. Process the jars in boiling water, with the jars submerged by at least one inch, for 15 minutes. If you are not canning the butter, store it in the freezer or refrigerator. This is one of my older daughter's favorites, but I've never made it from scratch either. I am going to do it today, though, because she is at home (sick) and what could be better for an invalid? I'm also making some gingerbread -- which is my number one favorite thing to have as soon it starts feeling fall-ish. I wonder how they would taste together? And Thanks, SO MUCH, for your great comments on domestic sensualist. It is great to get a dialogue going again. This is a great idea -- I also have an overrun of apples from my CSA. I would probably prefer to make this in my crockpot - how would you suggest I adjust the recipe/technique? I'm guessing I would still want to do the first bit (boiling the quartered apples) on the stovetop and then use the crockpot for after food-milling? Thanks for the recipe! Looks delicious! Oh, I made apple sauce this past weekend and it made my whole house smell cozy and wonderful. I don't know why I've never tried making apple butter! Thanks for the recipe. I know my family will love it. PS Another hand up for the muffin recipe, please! Hope your daughter feels better soon, Bee! Apple butter and toast sound like great things for an invalid. Gingerbread! It's finally that time, isn't it. Do you make soft, cakey gingerbread or cookie-like gingerbread? Alicia - using a crock pot sounds like a great, hassle-free way to do it. I've never done it that way (I don't have a crock pot) but I checked a few recipes online. You could cook the apples, mill them, and then do the rest in the crock pot; or you could use peeled, cored apples (and ground spices rather than whole ones) and stick everything in the crock pot at once. Whichever way you do it, cover the pot and set it on low heat, then just wait! The first time you make it this way, you'll probably want to check it periodically to make sure that the heat's not too high. I've seen recipes where it's left to do its thing overnight, which makes me think it must take 7-8 hours. Groetjes, JaPRA! I love getting up these little tidbits of Dutch from you. (I'm such a sucker for languages.) I'm tickled that both you and Bee make your own applesauce. I know so few other people who make it themselves! Wow, I've never made apple butter. Yours looks mouthwatering! I'm actually going apple picking this weekend -- if the weather holds up -- so I'll keep this recipe in mind. Anne - This recipe (and Ina Garten's for cream of tomato soup) made me decide that I FINALLY needed a food mill. It took ages for find one, though. I had to go to about 6 stores and finally found one at a specialist shop. Meanwhile, we ate most of the apples that I had purchased to make this apple butter! I will try again this weekend. Beautiful blog... I'm new here! Your photos are amazing! Going to go poke around now... WOW! Congratulations on the food mill, Bee! (I'm a bit late responding to this comment...) I hope your daughter doesn't consider it just another reason you're "old." They can be quite difficult to find here, too. Oddly enough, when I was in Edinburgh a few months ago I poked my head into a housewares store and saw the (Italian) one I have at home. I suppose you never know where you'll find this sort of thing! Welcome, Rose, and thank you!